This article explains how to run linear regression in R. This tutorial covers assumptions of linear regression and how to treat if assumptions violate. It also covers fitting the model and calculating model performance metrics to check the performance of linear regression model. Linear Regression is one of the most popular statistical technique. It has been in use for more than 3 decades. It is widely accepted in almost every domain as it's easy to understand output of linear regression. It is a way of finding a relationship between a single, continuous variable called Dependent or Target variable and one or more other variables (continuous or not) called Independent Variables. It's a straight line curve. In the above figure, diagonal red line is a regression line which is also called best-fitting straight line. The distance between dots and regression line is errors. Linear regression aims at finding best fitting straight line by minimizing the sum of squared vertical distance between dots and regression line. Linear regression requires the dependent variable to be continuous i.e. numeric values (no categories or groups). Linear regression can be simple linear regression when you have only one independent variable . Whereas Multiple linear regression will have more than one independent variable. b0 is the intercept the expected mean value of dependent variable (Y) when all independent variables (Xs) are equal to 0. and b1 is the slope. b1 represents the amount by which dependent variable (Y) changes if we change X1 by one unit keeping other variables constant. The difference between an observed (actual) value of the dependent variable and the value of the dependent variable predicted from the regression line. Linear regression is based on least square estimation which says regression coefficients (estimates) should be chosen in such a way that it minimizes the sum of the squared distances of each observed response to its fitted value. Linear regression requires 5 cases per independent variable in the analysis. 1. Linear Relationship : Linear regression needs a linear relationship between the dependent and independent variables. 2. Normality of Residual : Linear regression requires residuals should be normally distributed. 3. Homoscedasticity : Linear regression assumes that residuals are approximately equal for all predicted dependent variable values. In other words, it means constant variance of errors. 5. Multicollinearity : It means there is a high correlation between independent variables. The linear regression model MUST NOT be faced with problem of multicollinearity. It states that the errors associated with one observation are not correlated with the errors of any other observation. It is a problem when you use time series data. Suppose you have collected data from labors in eight different districts. It is likely that the labors within each district will tend to be more like one another that labors from different districts, that is, their errors are not independent. The concept of standardization or standardized coefficients (aka estimates) comes into picture when predictors (aka independent variables) are expressed in different units. Suppose you have 3 independent variables - age, height and weight. The variable 'age' is expressed in years, height in cm, weight in kg. If we need to rank these predictors based on the unstandardized coefficient, it would not be a fair comparison as the unit of these variable is not same. Standardized Coefficients (or Estimates) are mainly used to rank predictors (or independent or explanatory variables) as it eliminate the units of measurement of independent and dependent variables). We can rank independent variables with absolute value of standardized coefficients. The most important variable will have maximum absolute value of standardized coefficient. A standardized coefficient value of 1.25 indicates that a change of one standard deviation in the independent variable results in a 1.25 standard deviations increase in the dependent variable. It measures the proportion of the variation in your dependent variable explained by all of your independent variables in the model. It assumes that every independent variable in the model helps to explain variation in the dependent variable. In reality, some variables don't affect dependent variable and they don't help building a good model. In the numerator of equation above, yi-hat is the predicted value. Mean value of Y appears in denominator. Higher the R-squared, the better the model fits your data. In psychological surveys or studies, we generally found low R-squared values lower than 0.5. It is because we are trying to predict human behavior and it is not easy to predict humans. In these cases, if your R-squared value is low but you have statistically significant independent variables (aka predictors), you can still generate insights about how changes in the predictor values are associated with changes in the response value. Yes, it is when horizontal line explains the data better than your model. It mostly happens when you do not include intercept. Without an intercept, the regression could do worse than the sample mean in terms of predicting the target variable. It is not only because of exclusion of intercept. It can be negative even with inclusion of intercept. Mathematically, it is possible when error sum-of-squares from the model is larger than the total sum-of-squares from the horizontal line. It measures the proportion of variation explained by only those independent variables that really affect the dependent variable. It penalizes you for adding independent variable that do not affect the dependent variable. Every time you add a independent variable to a model, the R-squared increases, even if the independent variable is insignificant. It never declines. Whereas Adjusted R-squared increases only when independent variable is significant and affects dependent variable. It explains how close the actual data points are to the model’s predicted values. It measures standard deviation of the residuals. In the formula above, yi is the actual values of dependent variable and yi-hat is the predicted values, n - sample size. RMSE has the same unit as dependent variable. For example, dependent variable is sales which is measured in dollars. Let's say RMSE of this sales model comes out 21. We can say it is 21 dollars. What is good RMSE score? There is no thumb rule regarding good or bad RMSE score. It is because it is dependent on your dependent variable. If your target variable lies between 0 to 100. RMSE of 0.5 can be considered as good but same 0.5 RMSE can be considered as a poor score if dependent variable ranges from 0 to 10. Hence there is so such good or bad RMSE by simply looking at the value. Lower values of RMSE indicate better fit. RMSE is a good measure of how accurately the model predicts the response, and is the most important criterion for fit if the main purpose of the model is prediction. RMSE amplifies and severely punishes large errors as compared to mean absolute error (MAE). R-squared is in proportion and has no units associated to target variable whereas RMSE has units associated to target variable. Hence, R-squared is a relative measure of fit, RMSE is an absolute measure of fit. We will use mtcars dataset from cars package. This data was extracted from the Motor Trend US magazine, and comprises fuel consumption and 10 aspects of automobile design and performance for 32 automobiles. Variable description of the above variables are listed below against their respective variable names. In this dataset, mpg is a target variable. See first 6 rows of data by using head() function. To see the distribution of the variables, submit summary() function. Make sure categorical variables are stored as factors. In the program below, we are converting variables to factors. In this step, we are identifying independent variables which are highly correlated to each other. Since mpg is a dependent variable, we are removing it in the code below. 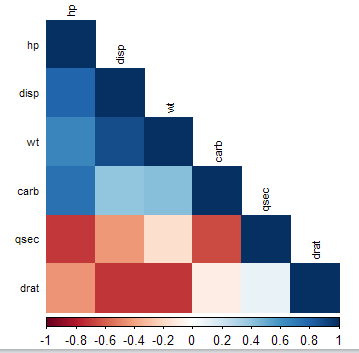 There are three variables "hp" "disp" "wt" that found to be highly correlated. We have removed them to avoid collinearity. Now, we have 7 independent variables and 1 dependent variable. At this step, we are building multiple linear regression model. Linear regression model tests the null hypothesis that the estimate is equal to zero. An independent variable that has a p-value less than 0.05 means we are rejecting the null hypothesis at 5% level of significance. It means the coefficient of that variable is not equal to 0. A large p-value implies variable is meaningless in order to predict target variable. Higher R-Squared and Adjusted R-Squared value, better the model. Whereas, lower the AIC and BIC score, better the model. AIC and BIC are measures of goodness of fit. They penalize complex models. In other words, it penalize the higher number of estimated parameters. It believes in a concept that a model with fewer parameters is to be preferred to one with more. In general, BIC penalizes models more for free parameters than does AIC. Both criteria depend on the maximized value of the likelihood function L for the estimated model. AIC value roughly equals the number of parameters minus the likelihood of the overall model. Suppose you have two models, the model with the lower AIC and BIC score is better. There are three variable selection methods - Forward, Backward, Stepwise. Look at the estimates above after performing stepwise selection based on BIC. Variables have been reduced but Adjusted R-Squared remains same (very slightly improved). AIC and BIC scores also went down which indicates a better model. Standardized Coefficients helps to rank predictors based on absolute value of standardized estimates. Higher the value, more important the variable. Variance inflation factor measure how much the variance of the coefficients are inflated as compared to when independent variables are not highly non-correlated. It should be less than 5. In the program below, we are performing 5-fold cross-validation. In 5-fold cross-validation, data is randomly split into 5 equal sized samples. Out of the 5 samples, a single sample which is random 20% of data is retained as validation data , and the remaining 80% is used as training data. This process is then repeated 5 times, with each of the 5 samples used exactly once as validation data. Later we average out the results. 60 Responses to "Linear Regression in R"
Thank you for stopping by my blog. Cheers! Keep the good work up..thanks..!! Glad you found it useful. Thanks! no habrá algo de regresion logistica? Are you seeing this tutorial from your workplace? Most of the companies block photo sharing websites. Thank you for stopping by my blog and sharing your feedback! I think a partial residuals analysis is to be added in order to look at the type of relation between each independent variable and Y. Thanks for your suggestion. I will add it to the code. when i execute the above command its trowing error. the function not found. then i install the caret package after that also i am not able to get this function and execute this command, please help me. Thanks, in advance. What's the error you are getting? Thanks! Even I'm getting the same error. If can add a model that you have prepared and explain each point here nothing can beat that and using SAS ... Will be eagerly looking forward to it..
Can you please share the Linear Regression with SAS article also. Thanks. Excellent Tutorial ....normally it's either Statistics or Programming ....here we find both well written!! Thanks a mill for sharing. Once recheck your dat3 object..
Is it the process we have to follow in realtime data analysis.? Very helpful tutorial. Thanks !! Is there any good dataset for practicing Linear Regression in R other than mtcars? I tried some datasets online but I found data is not good. It is because mpg is a dependent variable. In order to check multicollinearity which is high correlation between independent variables (not dependent variable). I think you got confused between dependent and independent variables. I'm a newbie to data science, is this the standard procedure data scientists follow to solve the regression problem? can i replicate the same method to all the problems and provide the inferences to clients. wonderful sir...may you help me on the commands to transform data into long format I am very new to R programming. 1.Is there no other way than eliminating multicollinear variables? 2. Why don't we find their combined effect on dependent variable? This is easy to understand and more powerful. The statistics concepts are totally new for me because I don't have maths & stat background even though I can understand this concepts easily with the help of this blog. Have you made any changes to the data? because i am getting these variables "cyl" "disp" "hp" "wt" "vs" "drat" as highly correlated at cutoff=0.7. If not, can you please tell me the reason why i am getting a different result? I have not made any changes to the data. It's hard to say without looking your data. What's more important is that you understand the concepts and implementation in R.
Right now I am on learning phase.I am having a question on why we are keeping cutoff ratio as 0.7? 1. Why did we drop all three highly correlated variables ("hp" "disp" "wt" )? Should we keep one of them? 2. Shouldn't we use absolute value cutoff for determine highly correlated variables? Hi can you please post for Linear Regression in SAS, only for programming in SAS. Thanks for the theory part its very clear. First of all thanks for providing this wonderful insight on "Linear Regression". could not find function "findCorrelation"
You need to install and load package named "caret" before using findCorrelation function. I already installed caret package and tried. Hi just want to know during linear regression function you have deleted three features based on collinearity, but after doing forward and backward steps to find out useful features you did not include any of the removed 3 features may I know why? You can try experimenting in including them and check collinearity again.